In one of my recent post’s I admitted to being a recovered perfume addict, however there is another addiction I have that I don’t plan to give up and that’s competition entering! Christmas is one of the best time’s for a compulsive competition enterer (yes I think I may have just made that word up!) and this year I won a couple of things, one of which was a Bourjois Magic Nail Polish Remover. To be honest I hadn’t really paid that much attention to this product as I didn’t realise that it was any different from a standard bottle of remover that you would use with cotton wool. However, this product is quite different. Inside the bottle is a sponge with a hole in the middle which is soaked in nail varnish remover. To remove nail varnish you basically dip your finger into the sponge, twist and remove, simple as that! Although this doesn’t work in a second it is very quick and removes polish cleanly, even dark polish only takes a couple of twists to be removed. I haven’t tried this with glitter varnishes but other reviews have suggested this is not a good idea as it gets messy (I can understand this as glitter gets everywhere and I’m sure one day it will take over the world!). The remover is acetone and paraben free and is fragranced with red fruit and vanilla. Although the smell from the bottle is quite strong and its quite strong when you first remove your finger, once the liquid has dried the smell is actually very pleasant. As well as glitter varnishes I’m also not sure that this would work with your toes, I haven’t tried it but I just can’t see this working out very well. However, discounting glitter varnishes and toes this is a great product that is quick and easy and perfect for travelling with. It’s also gentle and enriched with sweet almond oil so can be used as often as you want. 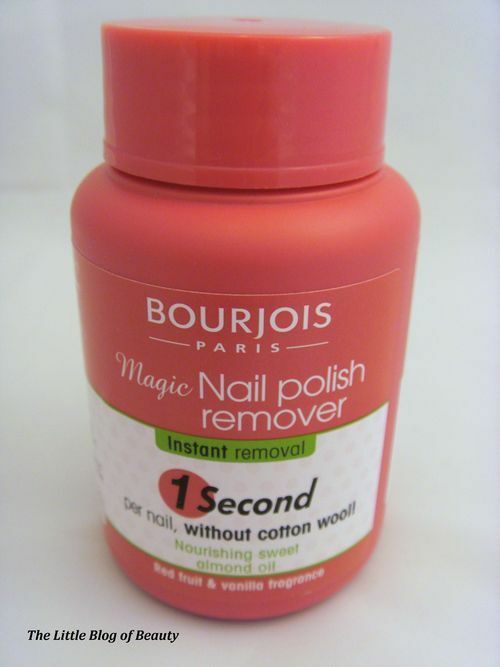 Bourjous Magic Nail Polish Remover won the Elle Beauty Award 2012 for best nail product.